Kingspan has designed a package of components for a truly THERMALsafe door. With Kingspan THERMALsafe you achieve a sectional door with the best thermal performance U-value, the best air permeability and the best wind resistance class. Highly conductive materials such as steel and aluminium are replaced by high-quality polythermalyne profiles and endcaps which substantially reduce thermal bridging (cold / heat transfer). THERMALsafe weatherseal has been designed to wrap around the steel tracks and also includes a compression seal to minimise the air leakage and cold bridging through the door frame. We take thermal performance seriously. All ThermAdor Residential doors are manufactured to the highest quality standards using only insulated panels and hardware by Kingspan. If you wish to increase thermal performance even further, you may upgrade the hardware on the door with additional Kingspan THERMALsafe components. Exclusive to TiltAdor, ThermAdor Residential with THERMALsafe is Europe’s leading insulated sectional door offering unparalleled energy efficiency with a significantly lower U-value and air leakage reduction. Air permeability – the loss of heated / cooled air from inside the building through gaps, holes etc. The U-value of a material is a measure of the amount of heat that passes through a surface area of 1m² for each degree of temperature difference. Therefore, the lower the U-value, the more energy-efficient the material is. The U-value is a function of the thickness of the material and its thermal conductivity. 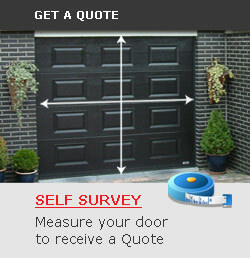 To properly calculate the U-value of a garage door, one needs to take into account not only the door panel BUT ALSO panel joints, side seals and other places that the heat can be conducted. Designing a sectional door that combats these issues is a challenge…Kingspan has surpassed this challenge with THERMALsafe Superior Insulation performance guaranteed. Maximum achievable Wind Resistance rating of Class 5 equivalent to 166 km/hr i.e. hurricane force winds. Air-permeability Δp at a pressure of 50 Pa [m3/m2h] - class 2 ≤ 12 m3/m2h - class 4 ≤ 3 m3/m2h loss of air through the door. Wind resistance class 5 >1000Pa (maximum rating achievable). The ThermAdor range has undergone rigorous independent testing by SP Technical Research Institute of Sweden so you can be confident that it fully complies with current legislation. It’s our commitment to high quality that makes us first choice with architects, contractors, developers and homeowners.